A book preview is a short commercial with images, music, voice-over, sound effects and text that promotes a book. Think of it as a movie trailer for books. Within this list you will find links to videos about books and their illustrations. Some will be book trailers, others will be authors or illustrators giving you a behind-the-scene look at their process or stories. This subheading includes beginning-to-read,, illustrated / short chapter books, and middle grade books. They are sorted by title. Adolescent Literacy (Adlit.org) Meet the Author – This video collection introduces you to authors and their books via an intervie format. 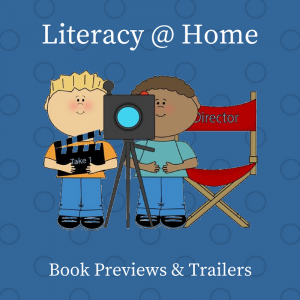 Book Trailers for Readers – Teacher Librarian Michelle Harclerode started her video Book Trailers collections on a wiki. Now they are a dedicated YouTube channel. Children’s Books is a YouTube channel where a narrator (a former teacher) reads picture books out loud. The teacher has been loading “a couple books a week” since 2016. If you want a preview of a book before selecting it, this would be a great place to search first. WhereDoBooksComeFrom.com – Go behind the scenes and follow the book publishing process from start to finish in a seven-video series for book lovers, students, and aspiring writers. KiDEOS – Here’s a range of videos for kids, with a nice simple interface. Categories that support literacy are Book Characters, Nursery Rhymes, Fairy Tales and Dr Seuss, but there are many more wonderful opportunities to link to songs and stories. MrsP.com – Mrs. P reads classic children’s stories that have proven their value through the test of time. The authors whose work is presented on MrsP.com are the finest writers who ever lived. To complement the storytelling experience, Mrs. P commissions both new and established artists to create original artwork for each story. Her magical library that literally comes alive and visits from some unexpected and sometimes famous guests — the heart and soul of our content on MrsP.com will always be a gifted storyteller reading great stories enhanced with a few simple illustrations. Mrs. P prefers not to compete with big-budget Hollywood movies, elaborate video games and virtual worlds; she would like to help kids learn to use their imaginations. Multicultural Minute – Each week, Renee of Shen’s Books (publisher) creates a one-minute video about a topic relating to multicultural books. Vid-E-Mos – a collection of videos featuring award-winning author Mo Willems talking about many of his books. If you liked this page, you may also like our Authors and Illustrators Online page. Many authors have book trailers and interviews about their books on their sites.